Obitcheery and Lien Foundation are offering the opportunity to pay tribute to a loved one who has passed on by sharing a story about them, with selected entries receiving a unique In Memoriam classified created and published in the Straits Times or Lianhe Zaobao. Tell us how your loved one impacted your life or how unique they were. It can be a memory, a philosophy they lived their life by, or anything about their life or character that has special meaning to you. *The closing date for nomination is 12 May 2013. Terms and conditions apply. 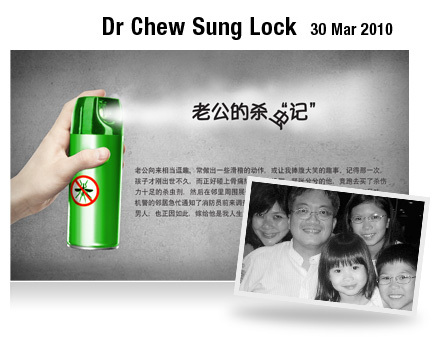 Dr Chew Sung Lock, affectionately known as Slock, was a reliable man who was very protective of his family. He was also a funny man, often displaying comical antics or creating amusing incidents that make people laugh. In one particular incident, his child was just born, and it happened to be a dengue peak season. Anxious, he purchased an extremely potent insecticide and sprayed around the neighbourhood. As there was a weird smell everywhere, worried neighbours actually notified SCDF about it. But that was just one of his ways of showing his love to his family, doing his best to protect them from harm. 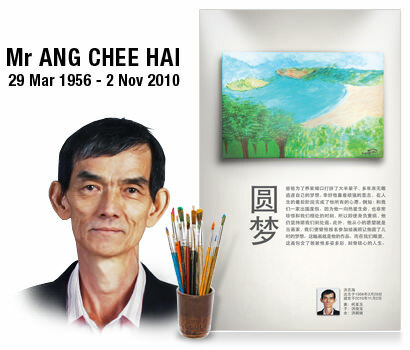 Dr Chew passed away on 30 Mar 2010, at the age of 46. 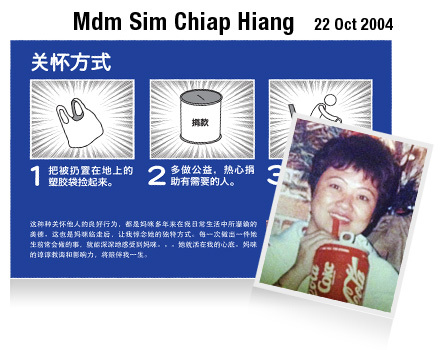 Mdm Sim was a loving mother who had nurtured her children to be kind and gracious to others. Her daughter, Ms Annie Tan, recalls vividly how she would always pick up plastic bags littered on the floor to prevent others from slipping, give up her seat in MRT and buses to the elderly, and donate generously to charity. Now, it is through doing these good deeds that Ms Annie Tan remembers her selfless and kind mother. Mdm Sim passed away on 22 Oct 2004, at the age of 53. Mdm Lin was a compassionate woman with great generosity to the people around her, and a soft spot for animals. As her husband passed away at an early age, she took on the significant role of providing for her children. While she was uneducated, she had high hopes for her children, and made sure that they received adequate education. She was an excellent chef, and took pleasure in preparing meals for the family that were cooked with tender love. Even after her passing, her children and grandchildren can still remember the great taste of her dishes, and the sweet memories of the good times they spent together. 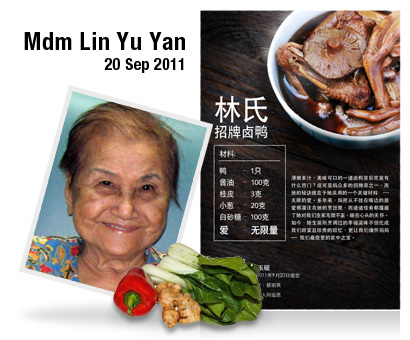 Mdm Lin passed away on 20 Sep 2011, at the age of 88. Mdm Siew was a role model for her nine children, exemplifying great kindness, love, humbleness and forgiveness. In her younger days, she worked very hard together with her husband in order to provide for the family. She would wake up very early every day to work at a rubber plantation. As she did not know how to ride a bicycle or motorbike, she had to walk about 7 miles to and fro, carrying about 40kg of latex on the return journey. After a short rest, she would set out with her husband again to tend the wild lallang in the rubber estate. Seeing how much she had given to the family, her children are extremely grateful for all the love she showed. 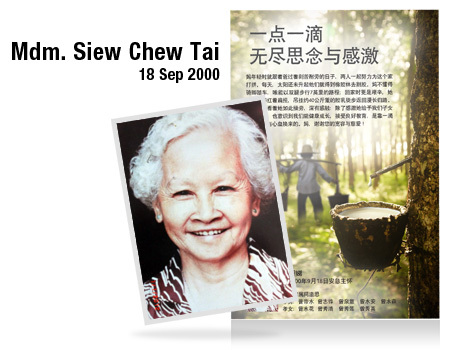 Mdm Siew passed away on 18 Sep 2000, at the age of 90. 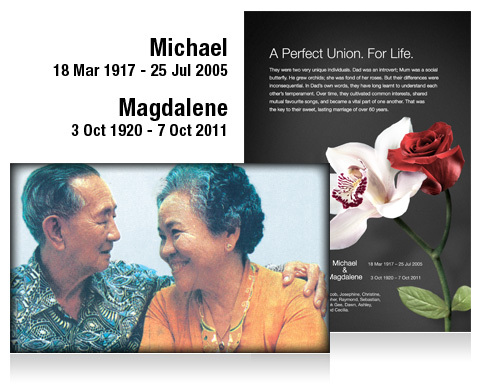 Married in 1940, Michael and Magdalene enjoyed a lasting marriage of over 60 years. They were rather different individuals; he was an introvert and liked to grow orchids, while she was a social butterfly who tended to roses. Despite this, they respected their differences, and cultivated common interests. They also shared mutual favourite songs, such as "Have I Told You Lately That I Love You" and "Ave Maria". Michael passed away on 25 Jul 2005, at the age of 88. Magdalene passed away on 7 Oct 2011, at the age of 91. 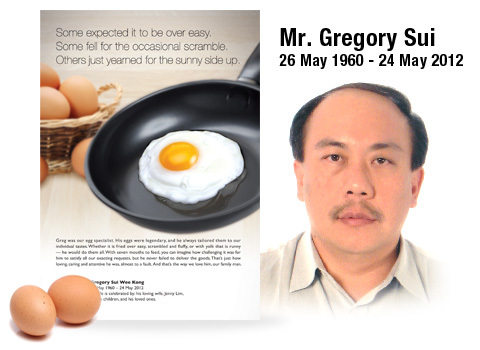 Mr Gregory Sui was a great cook who delighted in whipping sumptuous meals for his family. His eggs were legendary, and he would always cook it according to their preferences. He was also a foodie who would go to great lengths for good local food. At work, he was responsible, hardworking, and a good mentor. To friends, he was loyal, helpful and generous. To his family, he was a loving husband and father, caring and attentive almost to a fault. Mr Sui passed away on 24 May 2012, at the age of 52. 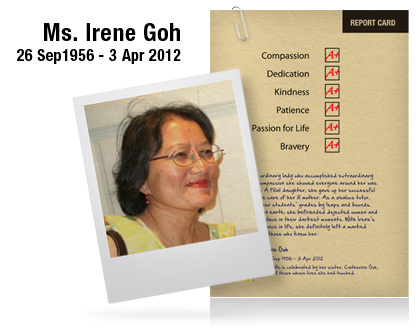 Ms Irene Goh was an ordinary lady who accomplished extraordinary deeds. She gave up her corporate and teaching jobs to give tuition at home so that she had the flexibility to take care of her aged parents. It was demanding as her mum was immobile and had dementia, but she was able to juggle her time well. She was extremely dedicated to her students, and helped pull up their grades by leaps and bounds. She also showed immense compassion to others in need, especially those who were sick, lonely or depressed, by spending time to keep them company and taking care of them. Even before her passing, she made preparations to ensure that there was continuous care for those who needed support. Ms Goh passed away on 3 Apr 2012, at the age of 56. 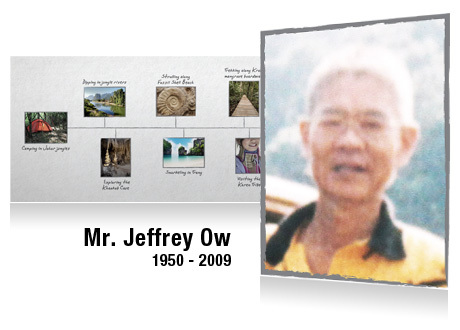 One of Mr Jeffrey Ow’s favourite hobbies was cross-country driving in 4x4 vehicles. While pursuing his passion, he always involved the whole family so that they could spend time and have fun together. He took them to many places in Malaysia and Thailand, such as Khaokob Cave, Fossil Shell Beach, Trang, Krabi, and even the Karen tribe. Despite his long fight with cancer, he never let that stand in his way to live a fulfilling life. With all the special memories that he had created with his family, he gave his children an unforgettable childhood. Mr Ow passed away in 2009, at the age of 59. 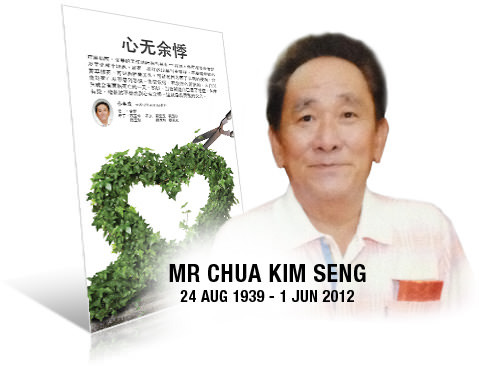 Mr Char Liang Peng was an independent and selfless person. He managed to carve out a career overseas, despite having to leave his family behind in Singapore. In the ‘70s, Mr Char went to Holland, and provided for his family by working as a chef. This was not an easy feat as he had to suffer in silence and loneliness, being in a foreign land. Luckily, with his sociable nature, he was able to mingle well with the locals. Despite the tough times, he managed to live a fulfilling life by his own means. In the final months of his life, his youngest son and daughter-in-law visited him in Holland. He shared a lot of his life stories during this visit. His son is glad to have spent time with him. Mr Char passed away on 17 February 2001, at the age of 61. His ashes were brought back to Singapore after his funeral in Holland. Although she became a masseur only in her later years, Mdm Salmah was very good at it. In fact, she was known as the “Magic Finger Aunty” by most of her clients because of her amazing massage skills. Despite her old age, she had no qualms about travelling to her clients’ homes to provide her services. Mdm Salmah started out as a masseur due to a wish to help an old lady with leg problems, visiting her twice a month to relieve her aches. The old lady’s condition improved a lot thereafter, and she was extremely grateful. By word-of-mouth, Mdm Salmah began to get more and more appointments. However, Mdm Salmah remained humble and was always eager to help. Those around her remember her as a good-natured and kind lady. Mdm Salmah passed away on 4 Dec 2011, at the age of 71. When Mr Roy Koh was diagnosed with his illness, he faced it with courage and never once asked, “Why me?” He was a brave fighter, and was always open to trying out new remedies. While he sought out these treatments, he would lighten up the mood by remaining upbeat and creating fun. Many of those around him did not know of his diagnosis and were all shocked when they learnt of his passing. He never displayed any signs of his illness. He did not mean to hide it; he just wanted to be treated normally, and avoid being a bother to anyone. That was him, a thoughtful man who never wanted to trouble anyone else. Yet, he was always supportive towards everyone around him. 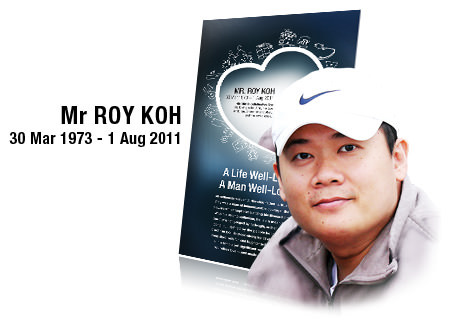 Mr Roy passed away on 1 August 2011, at the age of 38. 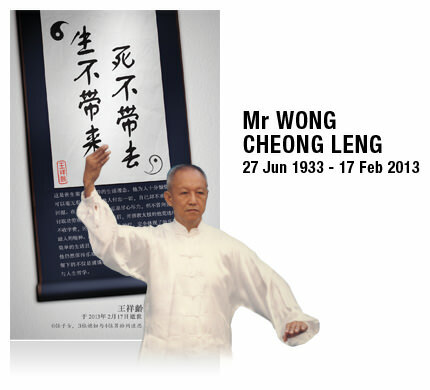 Mr Wong Cheong Leng was a quiet person. Through determination and good work ethics, he excelled in his job despite having little formal education. In his 40s, Mr Wong encountered some health issues, and decided to resign from his job upon some reflection. Thereafter, he devoted his time uncovering the wonders of Taichi, especially in the realm of healing and other related disciplines. He was always passionate to impart his knowledge to busy individuals who wished to improve their health. Being a qualified trainer, he volunteered his services at a local community club, and was able to help many people. In the last years of his life, despite being in pain, he had always been considerate to others. He never once complained, or showed any signs of frustration. Mr Ang passed away on 17 February 2013, at the age of 79. 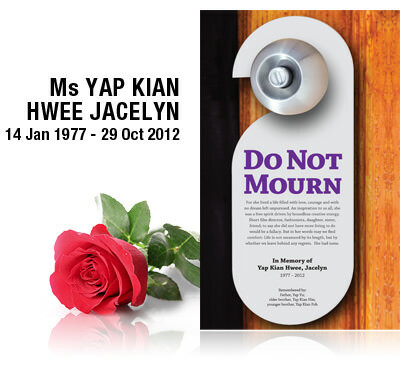 Ms Yap Kian Hwee Jacelyn will always be remembered for her strength, courage and conviction. Her statement made at a lunch gathering one week before her death is testament to this: Life is not measured by its length but by whether we leave behind any regrets. In her professional endeavours, she lived by this philosophy and recommended others to do so too. Her passion for the creative arts led her to take up the director role of an award-winning short film, Fallacy, and to give up a lucrative career in IT to further her interest in fashion design, while working in a fashion outlet. During her last days at Dover Park Hospice, she worked with the music therapist to compose a song that embodies the creative, free-spirited energy within her. Ms Yap passed away on 29 Oct 2012, at the age of 35. Mr Ang Chee Hai used to work as a bus driver and was the sole breadwinner of his family. Life wasn’t easy and he had to work both early morning and late night shifts, but in order to support his family, Mr Ang persevered without complaint. As the head of the family, he played a vital role in keeping the whole family bonded as one. A quiet person by nature, his actions and contributions to the family spoke volumes about his character. Before he departed, his daughter signed him up for a painting class so that he could fulfil his childhood dream of being an artist. He also brought his family on overseas trips to spend more quality time together. Mr Ang passed away on 2 Nov 2010, at the age of 54. A brave and optimistic woman, Mdm Foo was very strong in the face of her impending death. She remained cheerful and had no qualms talking about it openly. This allowed her to make preparations for her family and fulfil her final wishes. She left behind a box, with instructions to her husband to open it only after her departure. In it were letters she had written to each of her 3 children, her husband, mum, sisters, friends, etc. Mdm Foo also planned for her insurance monies to be used for her children’s education. Furthermore, she picked her own photograph for the wake and hearse in advance. 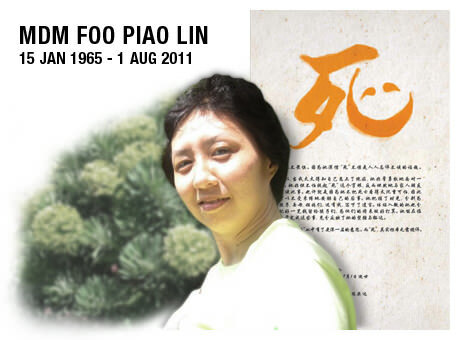 Mdm Foo passed away on 1 Aug 2011, at the age of 46. Mr Tan was a seaman, and had travelled around the world at least twice. His nieces and nephews always looked forward to the unique gifts he brought back, as well as recounts of his voyages. Among his souvenirs are a preserved piranha from Venezuela, a decorated ostrich egg, marble bookends from China, and many more. His culinary skills were also impressive. Whenever he was back in Singapore, he would be the appointed chef for family gatherings. Before he died, he passed down a cookbook to his niece, Eunice, with all the recipes he had accumulated over 50 years. Mr Tan’s nieces and nephews remember him as a fatherly figure who was generous with his kind words, encouragement and financial support to them. He passed away on 31 Dec 2012, at the age of 68. 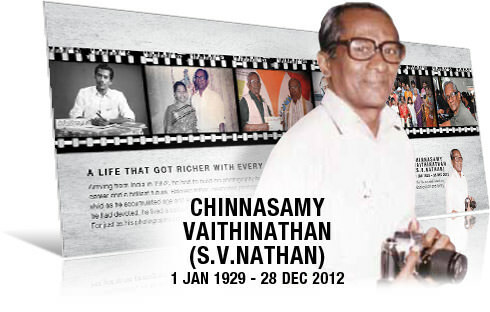 Mr Chinnasamy Vaithinathan (S.V. Nathan) was a renowned photographer in the Indian community. He was the first Indian Singaporean in the 1950s to turn a passion for photography into a profession; it became his first and last career. In 2001, Mr Nathan won a gold medal for Singapore in a photography competition held in Thailand. Besides photography, he was also involved in Indian dramas; he has acted, as well as written stories and scripts for many dramas. Family members and friends describe Mr Nathan as a kind, considerate and humble person who valued hard work and dedication to his profession. 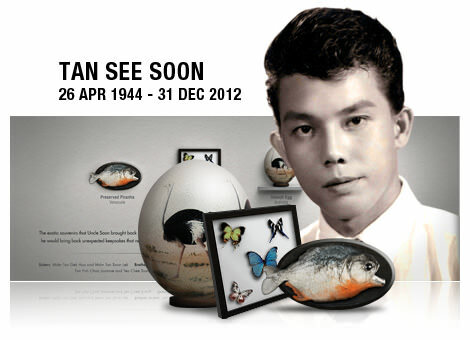 Mr Nathan passed away peacefully on 28 Dec 2012, at the age of 83. He is remembered by his wife, Baskaravalli, and family. Mr Chua Kim Seng used to work at the cemetery as a caretaker, in charge of cleaning up the area, raking leaves as well as simple pruning around the tombs. As the head of the family, Mr Chua would make an effort to gather his family at his house and cook a sumptuous spread for them. His children and grandchildren deeply miss his laughter and great culinary skills. Before he departed, Mr Chua was featured in a local TV programme which documented his life as a terminally ill patient. In one of the interviews, he remarked that there is nothing to fear of death, as it is something inevitable that will befall everyone. Mr Chua passed away on 1st Jun 2012, at the age of 73. 2 Winners will be selected in April, May and June, with judging based on originality. Judges’ decision is final. Winners will be notified on the email address provided during creation of Tinbox. Prize draw is limited to residents of Singapore.